YouTube videos hubby taught himself SO many things on YouTube. I love how short and helpful videos usually are on the site. I learned many blog tips on YouTube, how to upload my photos from my phone and even how to make baby purees! Local Library I've taken some awesome FREE classes on Excel and Word at my library. It's really awesome. I can jump in at any level and learn awesome tricks to make my life easier! I was able to make really inexpensive invitations for my little one's birthday in Word by the tricks I learned! Home Depot Garden Club Is a great resource for beginning gardeners! The free classes show you tips and tricks for successful gardening. Most of the classes I've taken are over the weekend and I often bring a kiddo to help! 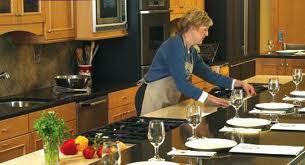 Dierbergs Cooking School is a local grocery store cooking school. The classes are really helpful on techniques and don't cost much. They also have a great class for kiddos. I took an awesome class on how to cook Thanksgiving and I felt more comfortable when all my guests were watching during the holiday! We learn LOTS of ways--how else do you learn!? We'd love to hear!